Pictures make great prompts to spark creative ideas and narratives. Recently author, Sandy Fussell, shared excellent tips for using pictures to help spark creative writing in kids in her guest post, Becoming a Story Detective. The trick is to find pictures that speak to you in some way. Browsing through photographs is one way to find them. Another is to be alert to great photo opportunities as you wander through life. If you enjoy the process of creating art, then I'm told splashing paint onto a canvas is a particular joy that can also unleash your creative self. For me though, sadly not a painter by any definition, an old picture can make a great prompt. There's something about vintage photographs that makes me immediately start to wonder about the expressionless character depicted. Does that gentleman with the stern face look that way because of the twelve kids in the picture? Is the lady not smiling because she realizes a spider just fell inside her blouse? Questions like are often all I need to start daydreaming, then jotting down ideas for a story. If you're looking for pictures you can use with your kids, try that dusty shoebox in Grandma's cupboard or some old photo albums. If you'd prefer someone else's digital photographs, I like Morguefile where you can use pictures you download without attribution. You can also try Public Domain Images Online which can be searched via categories like Historical. But my favourite source of really old photos is Wikimedia Commons, a database of over 7 million freely usable media files. did it cause a problem? what do they want more than anything else in the world? what's stopping them from getting it? or what is about to happen here? what can you smell, hear, see, taste here? Jot down ideas as fast as you can, scraps of phrase, words, whatever comes to mind. Save them in an ideas book, then let the sentences flow once your story becomes clear. Don't forget to ask what if? What if the old castle walls begin to crack and the flood waters are rising? What if the unicorn loses his magic? 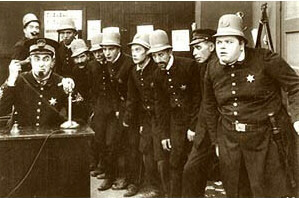 I found a Keystone Cops photo from 1914 at Wikimedia Commons. The date meant it's in the public domain, the attribution is : By Mack Sennett Studios [Public domain], via Wikimedia Commons. I'm not actually old enough to remember the films, but I loved the looks on the cops' faces, so I jotted down a snippet of telephone conversation and ideas. "What's that you say? The mayor's in a fish? Oh, in a fix. What kind of fix? Yes...Yes... I see. He's in the bathtub and his bow is caught in a flap. What? Oh, his toe is trapped in the tap!" and so on. I decided the room smelled of dust, mildew and onions, I could hear a cow mooing outside and my what if entailed the cow, festooned in someone's laundry, breaking into the police station and charging the chief. Old photos make a great start for illustrations in a child-created picture book too, as Tania McCartney told us recently in Crafting a Picture Book with Photos - Guest Post. My article today is the twelfth in a series of prompts that I hope might spark some creative expression in your kids, and maybe you too. I hope you'll join me so we can all challenge ourselves to be more creative. You can catch the rest of the prompts at the first post in the series, by scrolling down to Update. If you and/or your kids respond to this prompt and you'd like me to showcase it on my blog, I would be thrilled to do that. If you post it on your own blog, please let me know (in comments or email, via the Contact Me tab), and I'll add your link to the relevant post. Chris, isn't it great when something like that just flows? I'd love to write it as a pb for older kids, and use all old photos, but add speech bubbles etc. What's your favorite place on the internet to get picture prompts for kids to write with? I wish there was an easy answer, Jackie. If you're not worried about licensing ie you don't intend to publish the picture anywhere, just want your child to look at it, then I would go for Google images. I love Flickr, but Google reaches a wider range of images. Just put in the topic or idea and then wade through the results. When licensing is involved, it's a different story. I try to take copyright very seriously, always looking to see what the license is and attempting to fulfill the terms of the license. That isn't always easy as it's open to interpretation. I sourced the pictures for Sandy Fussell's Story Detective article, and I found the best range at Flickr, and used Compfight to find only CC licensed images, providing attribution at the bottom of the article. Often, I use Morguefile which allows you to use pics freely without attribution. I have heaps more bookmarked too. I guess rather than hide this stuff away in comments, it would be smarter for me to write a post about it. I'll aim for that in December.